The next stop on our UK adventure was Bath. We were so surprised at how tiny the area was and absolutely loved our Bed and Breakfast, Gray’s Bath. Our room was lovely and though Grays was a 20 minute walk into Bath, it sat up on a hill with a beautiful view of the city. This was our gorgeous room for a few days . . .
We spent our first day doing cheesy, fun and touristy things and had a blast! The Hop on/Hop Off Bus is always a good starting point to get your bearings in a new city. 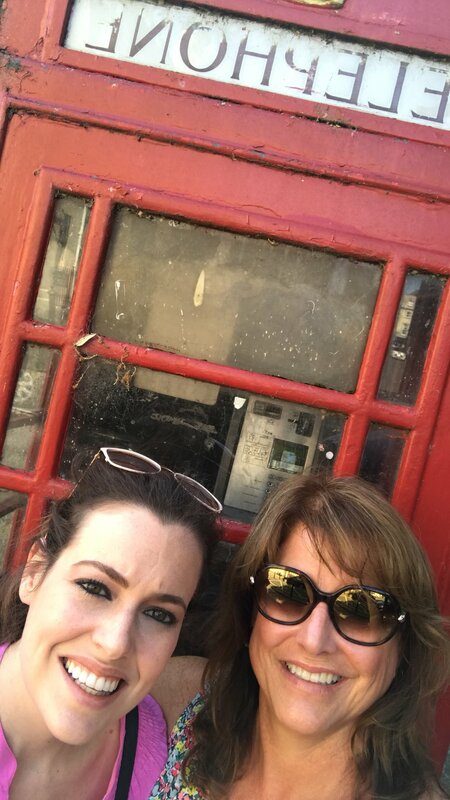 And of course, obligatory selfies by the iconic red phone booths! We spent our first day in Bath moseying around the city and stopping in places that looked interesting to us. First stop was the Fashion Museum of Bath for an exhibit of gowns of the Royals. Chelsea and I are real “royal geeks” so we didn’t want to miss this collection from Queen Alexandra, Victoria, Mary, Elizabeth and Princess Margaret! We dashed into a nearby, obscure restaurant and were treated to an unexpected phenomenal lunch at The Circus Restaurant. A beautiful dining room and superb lunch! We made our way to the Jane Austen Centre for a kitschy tour and a little Jane Austen history, but alas, no sightings of the elusive Mr. Darcy! Of course we couldn’t miss afternoon tea at The Pump Room Restaurant which was fun but a little touristy - we will be looking forward to more elegant venues when we reach London. After a long, hot day, we made our way up the long hill to our B&B and our cozy room. After an amazing breakfast in the gorgeous dining room at our B&B, we made our way out for another day of touring and sightseeing in the July heat. The Roman Baths were surprising and the museum and tour was exceptional. We never could figure out just how the Roman’s ended up there and built such an elaborate “spa,” and we also never could find out why they left! Never the less, it is quite a unique find and worth a few hours to visit and photograph! 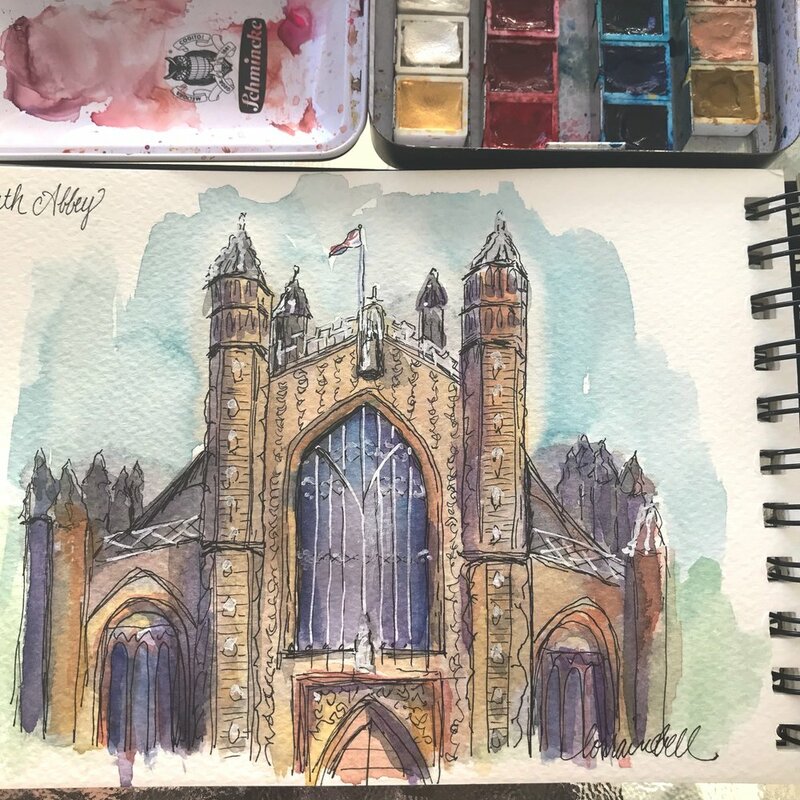 Although we missed seeing the inside of the Bath Abbey, the facade was beautiful and I was able to get a few sketches done. We ended our day with a dinner at Sally Lunn’s, the oldest house in Bath. Be sure to stop in to have a favorite meat pie served up in a “Trencher,” the famous Sally Lunn Buns used as a plate/bowl for your meal! A final walk along the River Avon at Sunset was a perfect end to our day and our time in Bath.